Good afternoon – just back from brunch with 3 of my brothers, 2 SILs, 2 nephews and 4 of my kids (and dh of course). It was an awesome, family-filled afternoon with tons of laughter and just a few tears. She shudders to hear it, and will evermore. Evermore to her fancy will sound like a knell! The shawlette is for the short voyages, when the sailor was only out for a couple of weeks, maybe a month. It’s mostly the frothy crest of the waves, but the wife knows that the sea is dark and may steal her happiness. 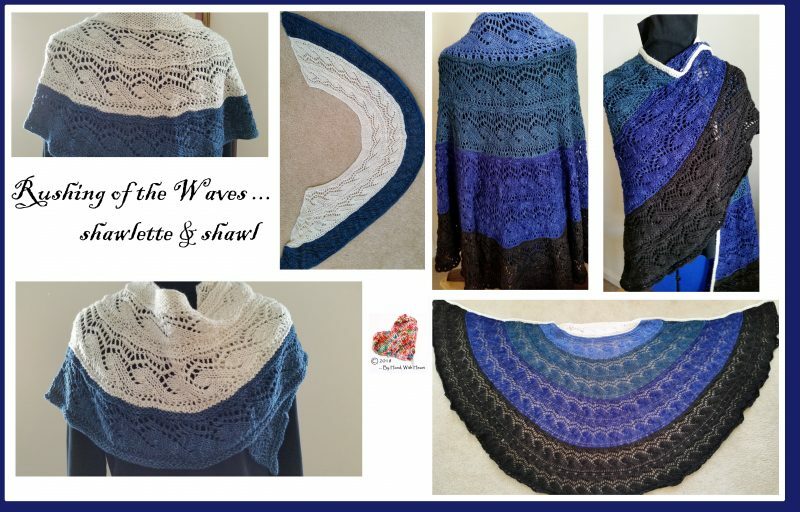 The shawl is for the longer voyages … the months of waiting to spot the ship coming back to port. The shawl starts out light, but the long months stretch out, creating fear that the sailor is not coming home. The bit of white extending down the edge of the waves represents the bit of hope that remains even into the darkest hour. This shawl is fun to knit – going from straight, flat knitting to turning the piece 90-degrees to knit the lace “border” stitch pattern … then back to straight knitting … then turn 90 degrees … and so on until the item is finished. The colors of the hand-dyed sport-weight wool make this design come alive. 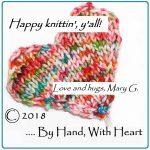 The design is available on Ravelry and Craftsy for immediate download.